With Valentine’s Day looming, if you’re looking to impress your significant other, there’s no better way than with a romantic getaway. Whether you’re staying in Dubai, heading slightly further afield, or wanting an international vacation, we’ve rounded up seven of the best on offer. If you’re after the most extravagant Valentine’s offering, we reckon we’ve found the package for you. Priced at a cool Dhs85,000, the Fairmont Dubai is offering a luxury long weekend package unlike any other. The two-night stay at the hotel’s Imperial Suite comes with a limo pick up, helicopter ride over Dubai, seaplane flight, private yacht trip, seven-course gourmet dinner on the hotel’s rooftop accompanied by a violin serenade, 100 red roses, a set of diamond jewellery, private couples massage, dinner at the Exchange Grill, and a private breakfast buffet on the Imperial Suite terrace before your stretch limo drops you home. What more could you want? For a staycation that feels miles away from the city, head to JA Jebel Ali Golf Resort. Enjoy an overnight stay at the JA Palm Tree Court suite, set amongst pretty gardens overlooking the Arabian Gulf for Dhs1,299 per suite per night. JA Palm Tree Court is a 15-minute drive away from Dubai Marina, and all bookings include an in-room breakfast. 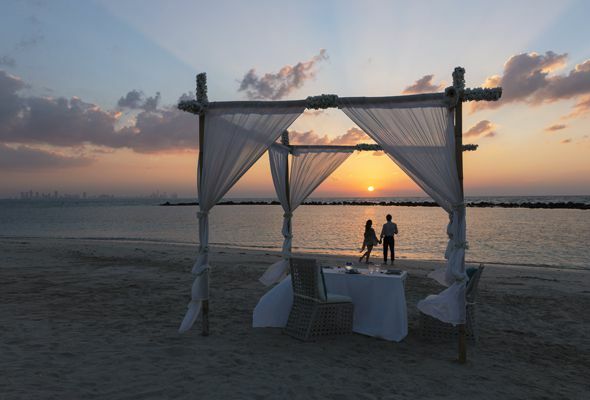 There is also an option to book a private table on the beach for Dhs1,500 per couple, including a bottle of Italian bubbly. The Waldorf Astoria is offering four unique Valentine’s Day packages. The one-night stay starts at Dhs1,760 including breakfast for two, but can be upgraded to include a romantic dinner for an additional Dhs1,200 without alcohol, or Dhs1,500 with alcohol. 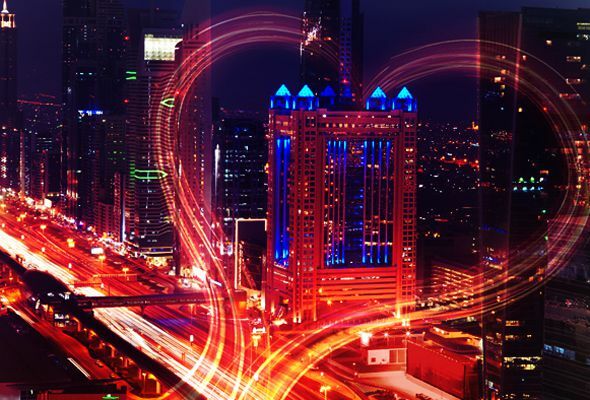 For the ultimate Valentine’s package, opt for the one-night stay and ‘Whole Day Astonishment with Dinner’ package for Dhs7,260. It comes complete with champagne breakfast, couples massage, afternoon tea, a sunset yacht tour of Dubai Marina and a five-course private dining experience. Nurai Island, a 12-minute boat ride from Abu Dhabi’s Saadiyat Island, has to be one of the UAE’s most picture-perfect destinations. They’re offering a one-night package in a romantic beach villa over February 14 and 15. The package comes complete with a couples spa treatment, breakfast in bed and dinner at the island’s signature restaurant, Frangipani. The Valentine-themed menu features dishes such as seared scallops, duck confit ravioli and chocolate and strawberry infused mousse. 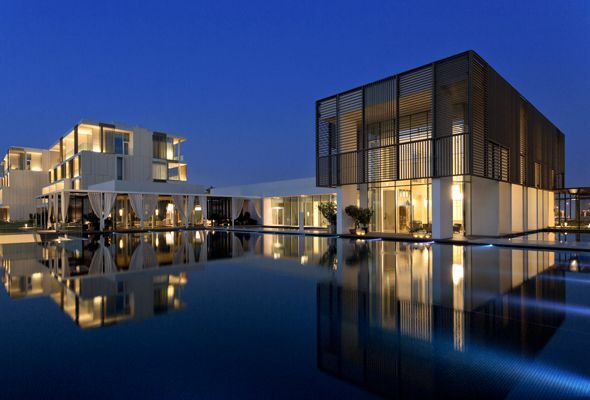 Just over an hour out of Dubai, you’ll find the Oberoi Beach Resort Al Zorah. 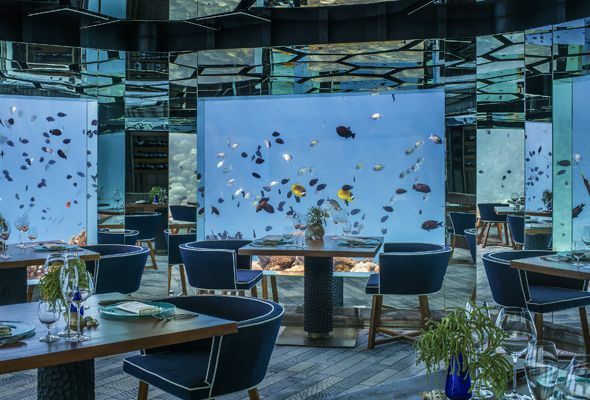 The modern five-star resort has packages ranging from a premier room priced at Dhs3,810 up to Dhs18,500 for two nights in one of the resort’s top level suites, which also includes transport by private seaplane. All one-night stay Valentine’s packages are inclusive of breakfast at Vinesse restaurant, a 60-minute massage for two, and a four-course dinner with a bottle of house wine. 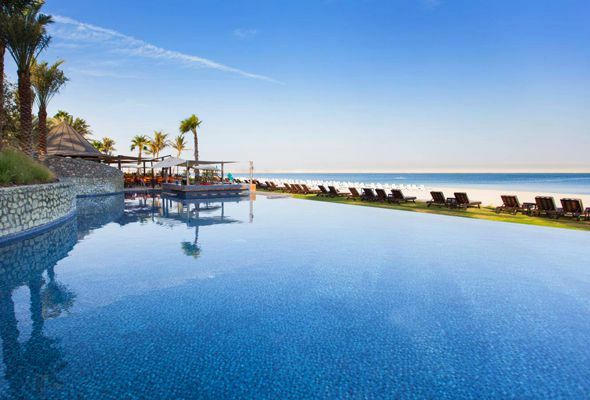 Hilton Al Hamra Beach & Golf Resort are offering February getaways with all the trimmings for a very reasonable price. 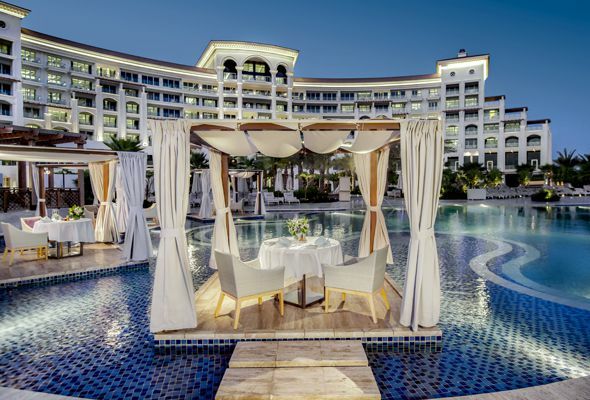 Couples can take advantage of an overnight stay at the resort complete with breakfast in the morning, plus three spa treatments per person from Dhs1,195. Also included in the package is a 2-for-1 voucher to the resort’s ‘Meat & Fish’ brunch on the beach every Friday, complete with unlimited fish and meat from the grill, bubbles and cocktails from 12pm to 4.30pm. If you’re looking for a trip slightly further afield this Valentine’s Day, the Anantara Kihavah is offering a Valentine’s themed four-night stay in one of their beach pool villas or over-water pool villas. It includes a daily buffet breakfast for two, a 150-minute Maldivan spa ritual for two, a champagne breakfast, and dinner on the beach. Prices start from Dhs5,600.